Mailchimp is a leading email marketing platform and has been expanding into a marketing platform beyond email. They have conquered their market share with small business owners and marketing consultants with their simple UI and the largest library of email templates for every need and style. While Mailchimp does offer support for email sequences and automation, their support for transactional email is serviced through a separate service Mandrill, which is priced separately from bulk/marketing email platform without any data integrations. So if you want a unified customer view and streamlined workflow for all your email marketing needs, BigMailer offers an advantage at simple low price. For example, if you send an email confirmation to your website visitors when they become members or start a trial via BigMailer’s transactional API, the subscriber record is automatically added to your pre-defined list and can trigger a welcome sequence. You can also have real-time subscriber data for your (bulk) marketing campaigns based on a transactional email, not to mention you actually control the email template and subject line of your transactional email in BigMailer (and not in your website back-end code). Mailchimp offers email support 5 days a week, but sometimes it takes 2-3 business days to get a reply. Does your business deserve better? We certainly think so – BigMailer offers live chat support 7 days a week that’s available to customers on all plans. Not convinced? 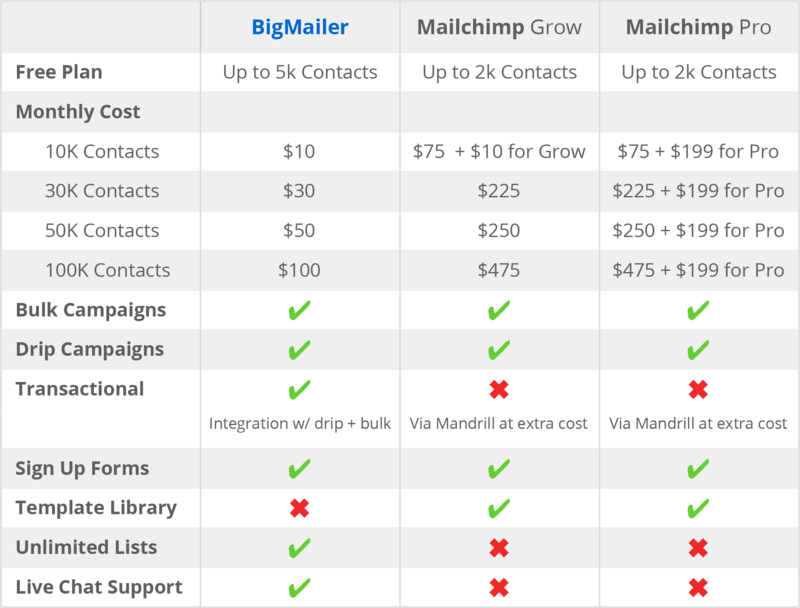 Check out the price and basic benefit comparison between Mailchimp and BigMailer.